This tool is an absolute MUST for pilot bearing removal. It's Snap-On tool # S-9095-A. You can see in the pic how I set it up for pulling Lucky's pilot bearing. After reading all the horror stories on this board about this job I figured I'd give it a shot anyway and see what happened. There's no room for a slide hammer, no room to swing a mallet and the oil pan's aluminum so getting a pry bar behind a bolt threaded into the PB is tricky. I ended up buying a 1/2" tap (the PB is threaded and some sources recommend screwing a bolt into it and pushing the PB out by tightening the bolt. DON'T do this; you'll just end up stripping the PB) and tapping the PB for a nice bug juicy bolt which I used the puller on. You've got a couple of cracks at this because there's enough metal in the PB to tap a couple of sizes. I did a 9/16" last night, and from the time I got the tap started to the time the PB popped out was maybe a total of 15 minutes, including time to squirm under the car and have a look at the oil pressure sender wiring. No Dremeling, no cursing, no stress. I'll see if I can find a source for the tool. It was part of a collection of tools we got from Mand's grandfather by way of her mom and dad, so it's old. 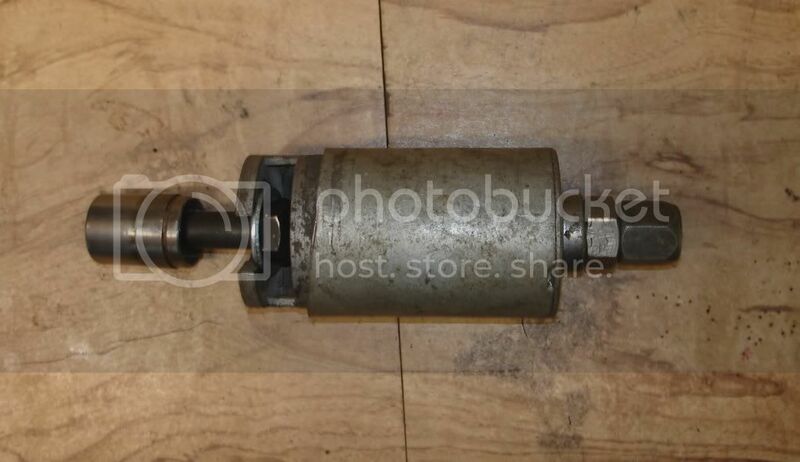 I was interested and found this puller on the snap-on site... would this work? It has the same type of design/components. The puller Slam showed has another concentric ring which presses around the pilot bearing; the one you linked to is lacking this additional piece. Ah... so the inner and outer shells assists in the removal of the pilot bearing?! Obviously I am a pilot bearing novice because I've never had to remove one before. At least, not yet! 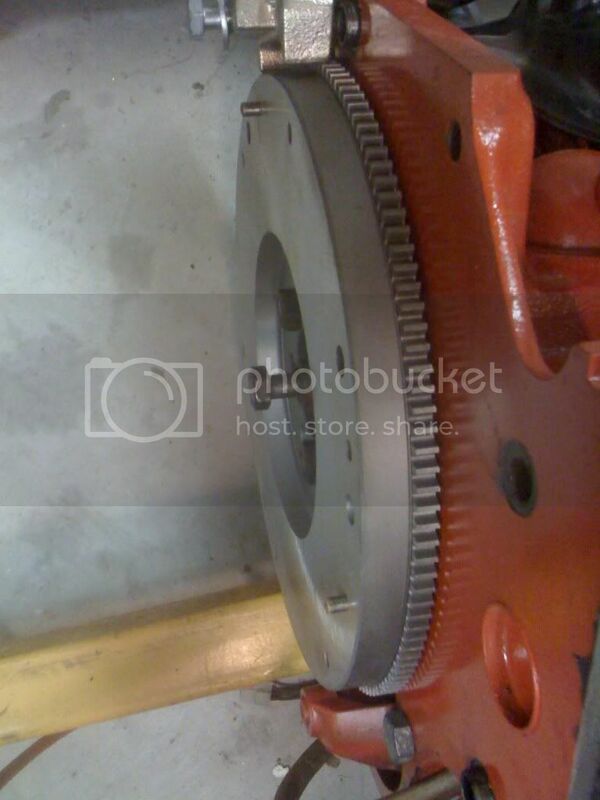 The inner shell pulls on the pilot bearing via the bolt down the middle, and the outer shell pushes on the flywheel. The tool you linked to pushes in the middle and puls on the outside; the tool above pulls in the middle and pushes on the outside. Yeah, as above. I haven't found a similar tool to the one I posted pics of yet, so perhaps it's not in production anymore. I'll keep looking. 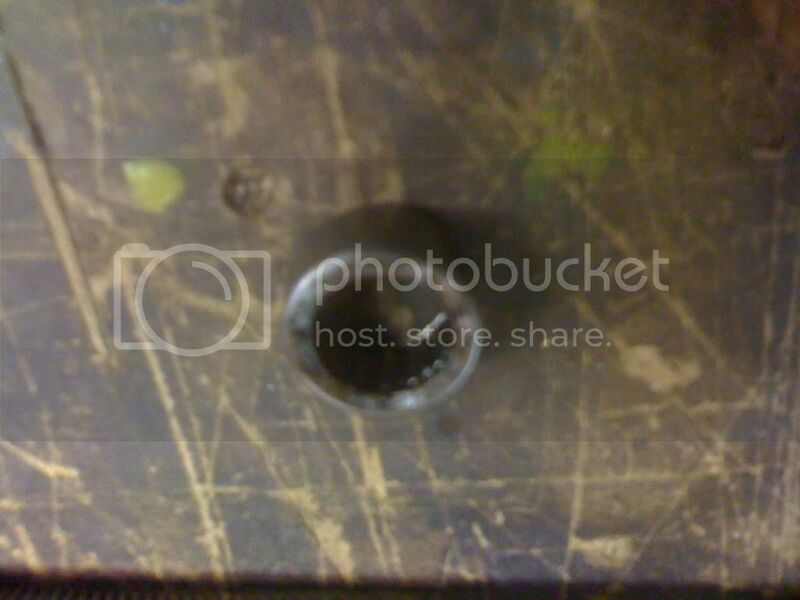 That's a 12mm x 1.75 bell-housing bolt threaded into the housing. Notice the flywheel lock. 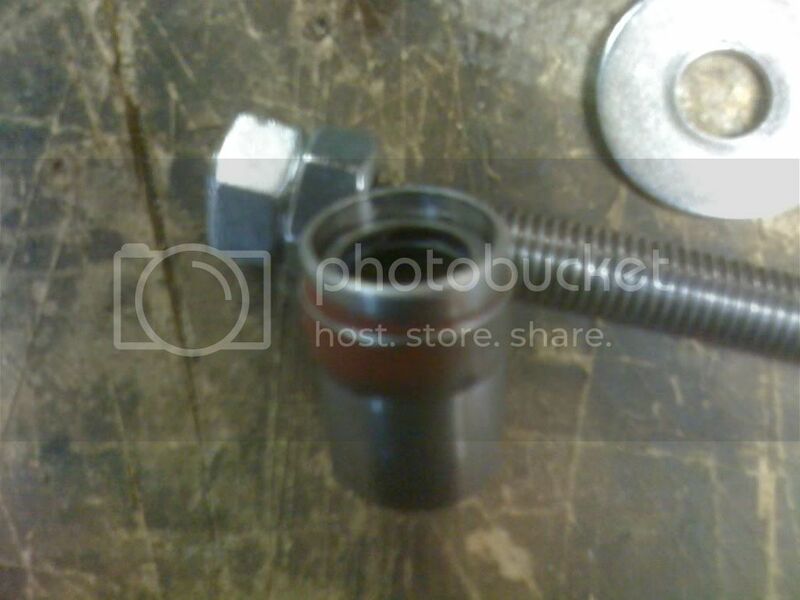 The Tool is a 12mm x1.75 threaded rod about 6" long with a 2" cast iron plumbing reducer, a large washer, a few 12mm nuts and a smaller washer. The threaded rod is actually a bolt that I cut more threads on and then cut the head off of. Worked well. I don't have pictures of it in use, but it works the same as the tool shown above. Just thread the rod into the bottom of the pilot bearing, put the pipe and washers in place with a nut threaded up against the washers. 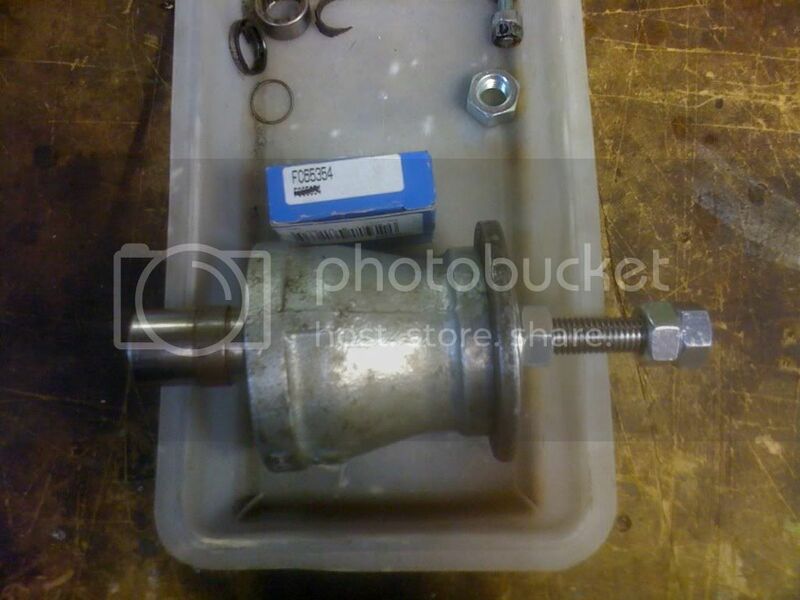 To remove, simply put a wrench on the nut and slowly crank down on it until it comes out. You might need to use another wrench or socket to hold the bolt/threaded rod still, which is why I had to put the double nut on the end. Once out, the real fun begins since you now need to remove the bearing from the housing. At least with it out, you have more access to it. I flipped the housing over and it fit perfectly into the large washer I had. All I had to do was remove the seal from the front with a screwdriver then use a punch and a hammer on the back side tapping in a circle to push the old bearing out. Installation of the new bearing is fairly easy. Just be careful to get it started straight and to get it properly seated against the ridge in the housing. The Ford 2.9L pilot bearing fits perfectly and has a seal built-in. Make sure you install it with the seal pointed out. To reinstall the housing, you'll just need to gently tap it in with a plastic or rubber hammer until it is seated properly. Make sure you lubricate it before you put everything pack together and make sure the end of the TT shaft is smooth and free of burrs, etc that could damage the bearing or the seal. Finally, I had a moment to work on the car. My approach. As usual, click for bigger pictures. I made a tool. Here it is in action. I didn't want to fight holding one thing while turning another, and I didn't want anything to mar the end of the crank shaft. This did the trick; I have no idea where those big knurled knobs came from, but they have a nice smooth surface that pressed against the crank. After that success, I wondered how to remove the needle bearing from the housing. Simple, I ground a washer in the following shape, popped it in behind the needle bearing, then put a dab of grease on the end of a bolt, and pushed it out. Now, I just need to source a new seal, as I destroyed mine when trying more brutal methods of needle bearing removal. Besides, it should be replaced anyway. For some strange reason, the threads in my bearing housing seemed very tight. I ran a tap through so that I could press the needle bearing out. The bronco bearing comes with a seal built into it. My replacement has a tiny little seal in it, nowhere near as good as the separate seal that came out. It seems to me it pays to be safe with an extra seal on something as important and inaccessible as the pilot bearing. Good instructions & details there guys, thanks for the write up. Moral of the story is to definitely use some sort of puller rather than probably stripping the PB threads. Tried a standard M12 (x1.75 pitch) as suggested, but it would not screw in much at all. Not sure if all PB`s are the same, however in my case the thread was actually M12 x 1.5. Stefan, would you happen to recall what year/ model Bronco PB you used or a part #? 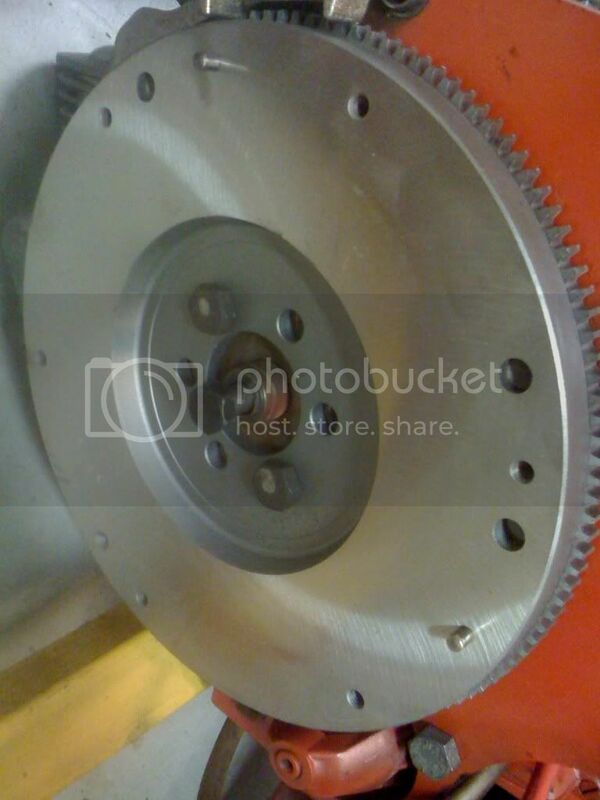 It`s somewhat difficult sourcing non genuine parts online just knowing the dimensions. Incidentally, the TT shaft spigot is 15.0mm. The crank bore is 24.0 mm dia. The PB retainer tube is 21mm ID x 24 OD. Seal is 15x21x 5. Hmm, I don't remember exactly. I got the idea from searching the forum here. Odd that yours is 12x1.5 (which is a more common thread to find, IME) As long as it works and you can get a threaded puller solution setup, you are well on your way. I wonder if this is why. 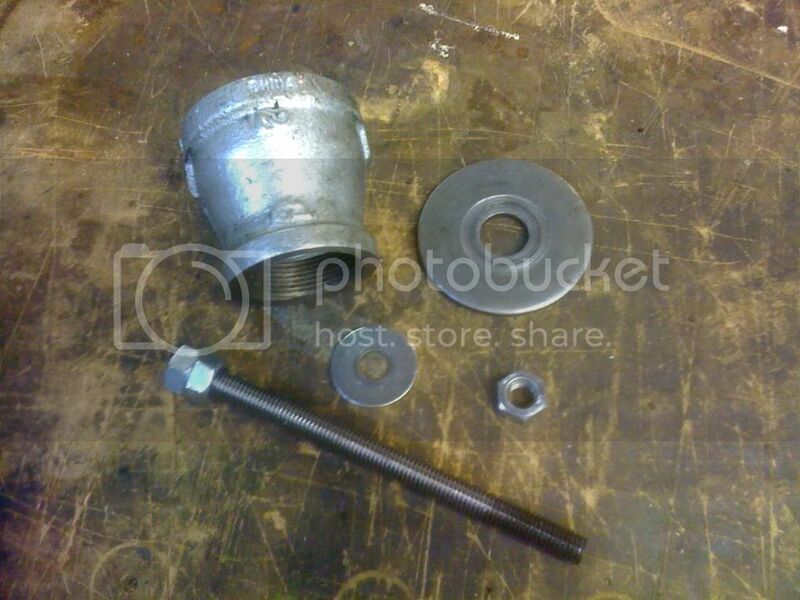 I just used one of the clutch bell bolts; I don't recall the thread. It seemed like it was the correct pitch, but the threaded portion of the bearing carrier was quite thin, so there weren't many threads. More pilot bearing details here.